Following the signing of a Memorandum of Understanding with the Ministry of Justice in the Democratic Republic of Congo in May 2016, IBJ officially opened a Defender Resource Center in Bukavu, in the Congolese province of South Kivu, in June. This marked the launch of IBJ’s 7th country program. IBJ’s DR Congo program is part of a larger Francophone Africa program supported by a generous grant from Global Affairs Canada, which IBJ is implementing in partnership with Montreal-based Equitas – International Centre for Human Rights Education. 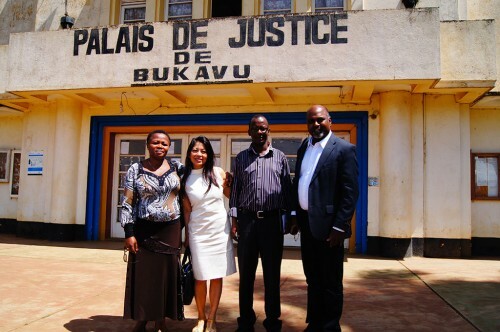 IBJ Founder Karen Tse and International Program Director Sanjeewa Liyanage visited Bukavu and Kinshasa in May 2016 to set in motion this new project. There is a great need for access to legal counsel in the DRC. While torture is criminalized in the DRC under Articles 16 and 18 of the Constitution, under Articles 67 and 180 of the Penal Code, as well as Law No. 11/008 taken up on July 9th, 2011, individuals in pre-trial detention are still extremely vulnerable to physical, mental, and sexual abuse, including torture. By visiting both jails, detention centers and “dungeons” (unofficial detention centers) with prosecutors, IBJ was able to provide earlier legal assistance to indigents and to prevent torture in detention. 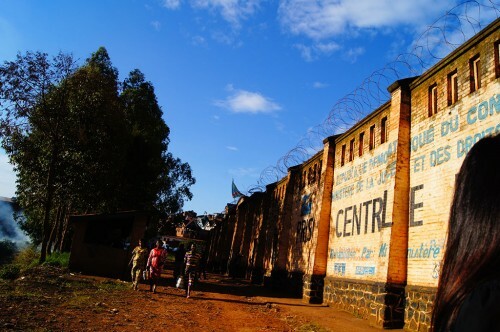 With 73% of the DRC’s prison population made of of pre-trial detainees, IBJ concentrates its efforts to provide legal help to individuals who are too poor to otherwise afford a lawyer. By taking on pro-bono legal cases, IBJ ensures that every woman, man and child accused of a crime is judged fairly in a court of law, to reduce prison overcrowding, and to reduce instances of abuse – which most often happen in pre-trial detention. With Avocats Sans Frontières, one of the main providers of pro-bono legal aid, having ceased their activities in the DRC in April 2016, and no state-sponsored legal aid available for indigent individuals, the need for access to legal aid is greater than ever. In August 2016, IBJ lawyers started taking on legal cases. In only 5 months, IBJ had provided legal representation to over 100 people. In addition, IBJ is fulfilling its mission of improving access to justice in the DRC and strengthening rule of law by undertaking several complementary activities. Through roundtable discussions, IBJ engages with key justice officials to discuss gaps in the criminal justice system and come up with recommendations to address existing problems. In December 2016, IBJ held two roundtables that were jointly hosted with the Ministry of Justice. The first was to diagnose the causes of the crisis of confidence between the people of Kavumu and the justice authorities which in September had led to the demolition of the courthouse and buildings housing the Congolese National Police. The second roundtable was held to determine how to promote better cooperation between different justice authorities and traditional chiefs to ensure the proper administration of justice. Over 50 officials attended the two roundtables, including magistrates of the Tribunal, members of the Prosecutor’s Office in Kavumu, police officials, members from the Ministry of Justice, and civil society representatives, who all appreciated it as a means of reducing the climate of mistrust in Kavumu. Rights awareness campaigns and radio broadcasts are conducted to ensure that more people are aware of their legal rights and aware of the resources available to them in case of arbitrary detention. With justice officials at the roundtables recommending the organisation of regular public awareness sessions to combat mistrust in justice institutions, IBJ carried out 4 rights awareness sessions in the DRC in 2016. In the short time since the beginning of the project, already hundreds of individuals have been impacted by IBJ’s work to make free legal representation widely accessible for all. The Defender Resource Center has become popular and well-known in the community, and many cases are referred to IBJ. There are still many challenges to overcome, but IBJ is scaling up its operations in the DRC to ensure that every woman, man and child accused of a crime is fairly judged in a court of law.